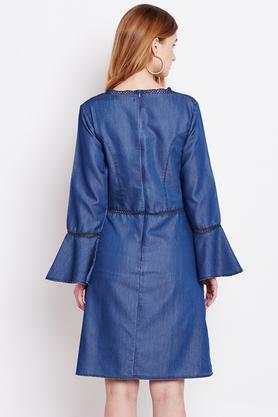 Add a touch of bohemian chic to your collection with this A-line dress from Marie Claire. Made from cotton fabric, this dress is lightweight. Featuring a V- neck, full sleeves and solid pattern, this dress possesses a stunning stylishness. Work a little edge in your casual styling with this A-line dress. Team this dress with a pair of sandals and carry a sling bag to complete the look.